They say everyone’s Irish on St. Patrick’s Day. As we noted yesterday, that’s definitely true in the Gaslamp Quarter during ShamRock when the streets are covered with more than 60,000 sq. ft. of bright green astroturf and more than 20,000 revelers pour in to listen to Celtic bands and DJ’s as they party into the night. During this, the largest St. Pat’s party west of the Mississippi, there’s no shortage of Irish-inspired drink specials for Harp, Guinness and Jameson lovers and you might even find someone pouring a green beer or two. Whether you plan to partake in the ShamRock raucousness or not, in my opinion, it’s advisable to make sure your St. Patty’s celebrations include a good meal and civilized drink or two. Just like most towns in America, there are many “Irish” bars in San Diego. That’s why, I want to share a couple of suggestions about where you can really find those smiling Irish eyes. The Field is a turn of the century Irish pub that was shipped literally piece by piece from Ireland to in the heart of San Diego’s historic Gaslamp Quarter. It still boasts the warm relaxing atmosphere of an old Irish country pub and serves the simple, hearty fare that is the signature of Emerald Isle cuisine. Dig into a bowl of Guinness beef stew rich with succulent cubed beef, potatoes, onions and carrots and seasoned to perfection with fresh herbs and of course Guinness. Enjoy melt-in-the-mouth corned beef served with red potatoes and tender cabbage or shepherd’s pie, a delicious combination of ground beef, diced carrots, peas, leeks and parsley topped with fluffy mashed potatoes lightly browned under the broiler. If you aren’t attending ShamRock, pop in for lunch on St. Pat’s but don’t dilly-dally. The pub is a center point of the festivities and once the party starts, the focus truly shifts from food to frolic. While I can’t promise The Ould Sod will be civilized on St. Patrick’s Day, I can promise it will be authentically Irish. This bar in Normal Heights, near North Park, has been Irish-owned for the last 20-years and is one of the oldest bars in town (the third-oldest, if you’re counting). 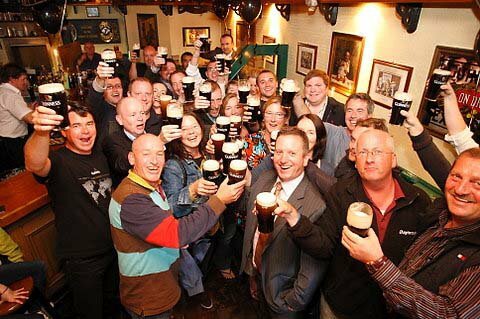 Famous for a wild live music scene, it’s a neighborhood pub but the Ould Sod always makes visitors feel right at home whether they’re ex-pat Irish, San Diegan or guests checking out our town. Sit back, order a beer and by night’s end you’ll be singing your heart out with strangers turned pals. Of course, if you really want to celebrate in civilized style, Loews Coronado Bay Resort is offering The Plough and the Stars Gondola Cruise. Sign up and you’ll enjoy a group gondola cruise through the canals and waterways of the Coronado Cays while tasting three Irish whiskeys paired with traditional Irish soda bread, Dubliner cheese and Irish sausage. The one-hour cruises depart at 5:30 p.m., 6:30 p.m. and 7:30 p.m. on March 17. The cost is $35 per person. Space is limited to 12 passengers per cruise. Reservations are required by calling 619-429-6317. Wonder what gondolas have to do with Ireland? Everyone’s Irish on St. Patrick’s Day! This entry was posted in Culinary, Insider Tips, San Diego Events and tagged coronado, dining, downtown, drinks, gaslamp, normal heights, st. patrick's day by Kate. Bookmark the permalink.